If you're collaborating with coworkers on Microsoft Word documents, and you're finding yourself frustrated because your collaborators are making changes without informing you, it’s time to turn on the Track Changes feature. This tool records all the changes that anyone makes to a document, so you can review every change and either incorporate it into the document or reject it. Track Changes is turned off by default. However, if you’d like to use it but keep forgetting to activate it while you’re reviewing a document--or if you work with someone who does--Word has a way to force the issue. I'll show you how to use this trick and several others. I’ll also show you how to avoid embarrassing yourself or your company. Add this indicator to the status bar to show whether Track Changes is active. To record changes to a Word document, click Review > Track Changes to turn the feature on. At this point, Word will track and display all additions or deletions you make to the document. Be sure to right-click the status bar and click Track Changes in the pop-up menu. Once you do so, a quick glance at the bottom of the document window will indicate whether Track Changes is on or off, and you can toggle between the two states by clicking the Track Changes button. Changes you make to a document when Track Changes is turned on will be marked up in a combination of color and formatting. The method that Track Changes uses to mark up the edits will depend on how Word is configured. Typically a vertical line will appear to the left of any text line that contains a change. Inserted text will be colored and underlined; deleted text will be formatted with strikethrough. As you work, you might find Track Changes' colorful markup to be distracting. You can hide the markup by selecting a different 'Display for Review' option from the Review tab. Generally the 'Display for Review' option is set to 'Final: Show Markup'. To change this, click Review, and in the 'Display for Review' drop-down list, click Final to see the document as it would look if all the changes were incorporated. This action doesn’t apply the changes--it just shows the document with the new text added and the deletions removed. To see the document as it was prior to the changes, click Original in the 'Display for Review' list. Click Final: Show Markup to return to seeing the changes marked up in the document. Use the Track Changes Options dialog box to see how tracked changes are marked up, and to make adjustments if necessary. To see the Word settings that control the formatting of added and deleted text, click Review > Track Changes > Change Tracking Options. 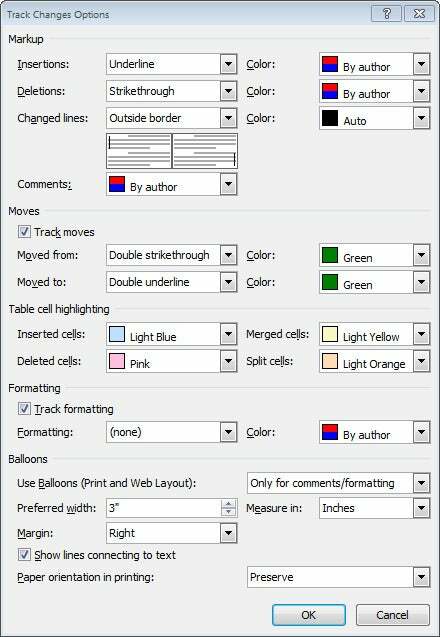 The default settings ensure that each person's edits appear in a different color, so you can easily identify them. You can alter the settings, but the only change I would consider is to disable the tracking of formatting changes and moved text. Before you finish and distribute a document, you’ll want to review the changes made to it. Click Review in the Ribbon, and then click Next. Word will take you to the first of the changes in the document. The change will be highlighted for easy identification. You can then click either Accept or Reject on that change (these buttons appear to the left of the Previous and Next buttons). Word incorporates accepted changes into the document, and undoes or deletes rejected changes. Immediately after you click either option, the cursor moves to the next change in the document. You can skip a change without dealing with it by clicking Next. If you want to accept all of the changes in the document at once, go to the Accept drop-down list and click Accept All Changes in Document. By the same token, if you want to eliminate all the changes, go to the Reject drop-down list and click Reject All Changes in Document.